"I'll give him four days to reply," uttered my five year old as she placed her letter to Santa into the mailbox. I instantly began to panic. It's the holiday season-- I have 100 things going on. It hadn't occurred to me that she would expect a reply. I began brainstorming ideas but unless I went through all the work of trying to design my own letter from Santa and mail it to her, I was out of luck. It also comes with a 60-Day Money-Back Guarantee. Z was absolutely in awe when her package arrived in the mail. It came in a shiny envelope, with a Santa stamp, and a return address in North Pole. She kept squealing "this is for me! From Santa, just for me!" She ripped it open and went through the papers one by one. We read the letter from Santa together and she was thoroughly impressed that Santa knew so much about her. Her favorite part of it all was the autographed picture of baby Rudolph and she loves it so much that it is hanging on a wall in her bedroom so she can look at baby Rudolph whenever she wants. I am really impressed with PackageFromSanta.com. I was able to place an order from them within minutes and their packages ship within 48 hours. The bonuses are available same day. Be sure to hurry and check it out for your children! 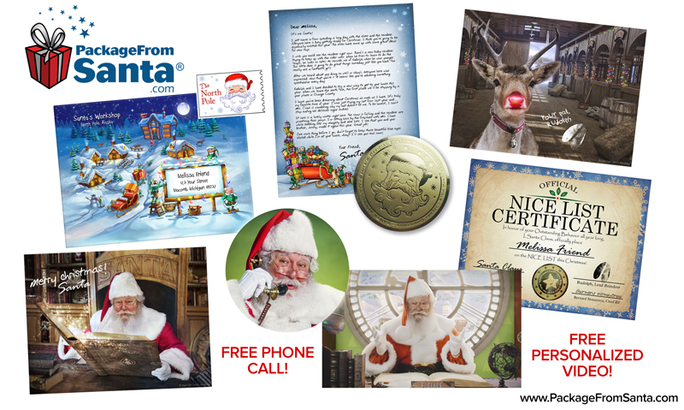 The experience and memories of an authentic Santa Letter can last a lifetime, for both the children and the parents. Order this holiday must-have for your child at https://www.packagefromsanta.com and save 25% OFF your order when you use FAMS17 at checkout! Disclosure of Material Connection: I received one or more of the products or services mentioned above for free in the hope that I would mention it on my blog. Regardless, I only recommend products or services I use personally and believe will be good for my readers. I am disclosing this in accordance with the Federal Trade Commission's 16 CFR, Part 255: "Guides Concerning the Use of Endorsements and Testimonials in Advertising." I do use affiliate links on my site so please assume that all links used are affiliate links!